The COMEPAL CRI hoists allow lifting loads of small and medium capacity. 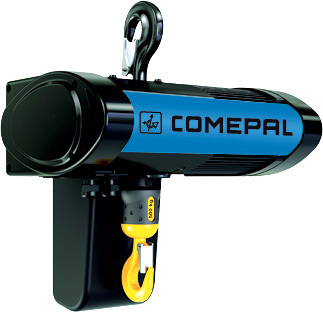 Belonging to the range of COMEPAL electric hoists,they combine performance and security in order to provide the greatest satisfaction to users. The double lifting speed allows a greater productivity and ensures an easy adaptation to stress lifting. The electric limit switches ensure the maximum upper and lower position of the hook. The lifetime of the lifting motor ensures a machine's operating up to 3200 hours (lifetime of the hoist). Disconnectable command cable and pendant unit available in 2 versions (2 or 4 buttons depending on the type of hoist). Tropic-proof protection (lifting and steering – 90 to 95 %). DIN upper and lower hook. Anti-drop rollers and anti-derailment device on the trolley. Body covered with a 70 μm epoxy powder paint. Service temperature range between -20 °C and +50 °C with rated load and speed. Pinion overhang on the output shaft. Two speeds with ratio 1/4 CR2, 1/6 for CR5 and CR12 . 400V/3Ph/50Hz or 460V/3 Ph/60 Hz power supply. 48 V low voltage command. Safety electric end of run for up and down position.